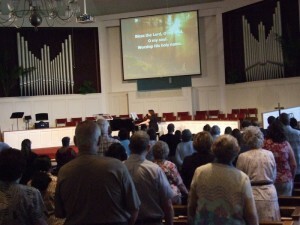 Yesterday I got to guest lead worship at Karl Rd. Baptist Church here in Columbus. This was especially fun for me because I’ve attended Bible Study Fellowship here for eons, and it was great to have a chance to help them out for a change. This church has a tremendous ministry right in their neighborhood and to the 600+ women and hundreds of children that come with them every week. It was great to be with them, and I’m happy to be heading back in August too! This entry was posted on Monday, June 30th, 2014 at 12:43 pm	and is filed under News. You can follow any responses to this entry through the RSS 2.0 feed. You can leave a response, or trackback from your own site.